Barça Women earned a well-deserved victory at Rayo Vallecano (0-4) in the match corresponding to the 20th day of the Liga Iberdrola season. Three more points for Lluís Cortés' side takes them to 54, just three behind the leaders, Atlético Madrid (57 points). Alexia Putellas, Martens, Mariona and Asisat Oshoala, who debuted with Barça, were on target. The match began with both teams cancelling each other out on the pitch, however, little by little, the Blaugranes asserted their authority in possession. Two goals in two minutes (Alexia Putellas, min 15; Martens, min 17) handed them the advantage, and from that point the visitors began to relax and play their natural game, Mariona adding a spectacular third (0-3, min 29). The second half saw Asisat Oshoala debut for Barça, and she opened her goalscoring account just a few seconds after entering the field of play (0-4, min 63). For the remaining half hour, the Blaugranes were content with keeping the opposition at bay, with no further goals added. Rayo Vallecano: Alicia, Pilar García, Mendióroz, Sheila (Martínez, min 81), Altuve (Iris, min 68), Sáez, Perarnau, Carreño, Andújar, Teruel (Jeni, min 46) and Silvia. 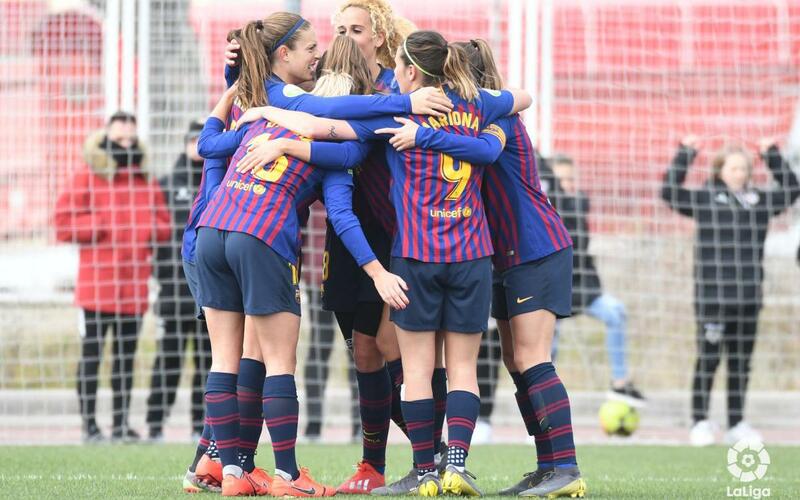 Barça Femení: Paños, Van der Gragt, María León, Melanie, Losada (Andonova, min 54), Mariona, Alexia (Oshoala, min 62), Duggan, A. Pereira (Candela, min 59), Hamraoui and Martens (Andressa Alves, min 45). Goals: 0-1, Alexia Putellas (min 15); 0-2, Martens (min 17); 0-3, Mariona (min 29); 0-4, Oshoala (min 63). Official: Villegas Navas. Yellow cards for Hamraoui (min 67) and Carreño (min 83). Red card for Andressa Alves (min 74).